Djamila Grossman | The Salt Lake Tribune California's Daniel Barrett (8) tries to catch the ball in a game against Brigham Young University in the National College Rugby Championship game at Rio Tinto Stadium in Sandy, Utah, on Saturday, May 21, 2011. Djamila Grossman | The Salt Lake Tribune Brigham Young University's Dylan Lubbe (10) gets tackled by California's Ryan Hodson (5) in the National College Rugby Championship game at Rio Tinto Stadium in Sandy, Utah, on Saturday, May 21, 2011. BYU lost. Djamila Grossman | The Salt Lake Tribune harrison ball whippy Brigham Young University's Andrew Harrison (15) gets tackled by California's Seamus Kelly (13) as Jared Whippy (12) watches on in the National College Rugby Championship game at Rio Tinto Stadium in Sandy, Utah, on Saturday, May 21, 2011. BYU lost. Djamila Grossman | The Salt Lake Tribune Brigham Young University's Andrew Harrison (15) jumps as the University of California at Berkeley's Dustin Muhn (14) and Drew Hyjer (4) try to grab the ball in the National College Rugby Championship game at Rio Tinto Stadium in Sandy, Utah, on Saturday, May 21, 2011. Djamila Grossman | The Salt Lake Tribune Brigham Young University's Apenisa Malani (6) scores in a game against the University of California at Berkeley in the National College Rugby Championship game at Rio Tinto Stadium in Sandy, Utah, on Saturday, May 21, 2011. Djamila Grossman | The Salt Lake Tribune Brigham Young University's Zeke Mendenhall (11) falls, as team mates Jared Whippy (12) and Villiami Vimahi (5) watch on in a game against the University of California at Berkeley in the National College Rugby Championship game at Rio Tinto Stadium in Sandy, Utah, on Saturday, May 21, 2011. BYU lost the game. Djamila Grossman | The Salt Lake Tribune Brigham Young University Dylan Lubbe (10) gets tackled by the University of California's Ryan Hodson (5) in the National College Rugby Championship game at Rio Tinto Stadium in Sandy, Utah, on Saturday, May 21, 2011. BYU lost the game. Djamila Grossman | The Salt Lake Tribune Brigham Young University Dylan Lubbe (10) passes on the ball as he gets tackled by the University of California's Ryan Hodson (5) in the National College Rugby Championship game at Rio Tinto Stadium in Sandy, Utah, on Saturday, May 21, 2011. BYU lost. Djamila Grossman | The Salt Lake Tribune Brigham Young University Sosaia (Hynie) Leaaetoa (7) scores against the University of California at Berkeley in the National College Rugby Championship game at Rio Tinto Stadium in Sandy, Utah, on Saturday, May 21, 2011. BYU lost. Djamila Grossman | The Salt Lake Tribune Brigham Young University's Dylan Lubbe (10) is helped up by Joseph Nicholls (14) and Andrew Harrison (15) after the team's loss against the University of California at Berkeley in the National College Rugby Championship game at Rio Tinto Stadium in Sandy, Utah, on Saturday, May 21, 2011. Sandy • BYU endured injuries and adversity this season, overcoming both to enter its biggest test undefeated and primed for glory. The only problem? The Cougars still had to face California. 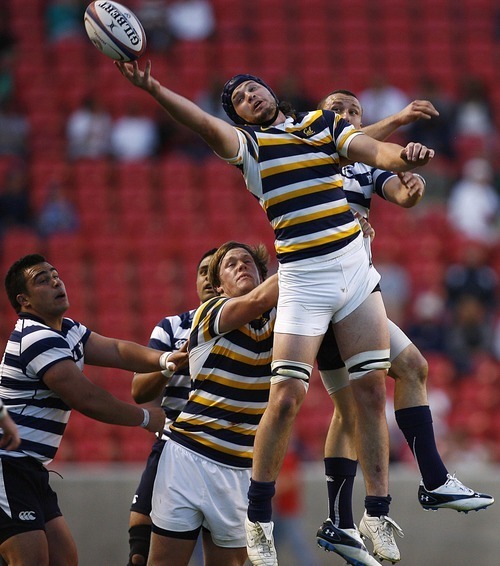 And as the Golden Bears have done so often in recent years when the rugby powerhouses met for the College Premier Division national championship, Cal again owned BYU when everything was on the line. The Golden Bears captured a 21-14 victory Saturday, claiming the collegiate title for the fifth time in six seasons. "I'm proud of the resilience of these young men," Cal coach Jack Clark said. 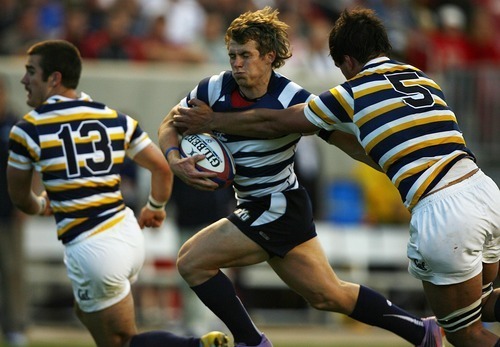 The Cougars clawed back from a 21-7 second-half deficit to thrill a blue-and-white dominated crowd of 11,000 at Rio Tinto Stadium during the closing minutes. But BYU (15-1) ultimately had no answer for the power and athleticism of Cal (27-0), and the Golden Bears ended their season the same way they did last year  outmuscling the Cougars and taking the crown. 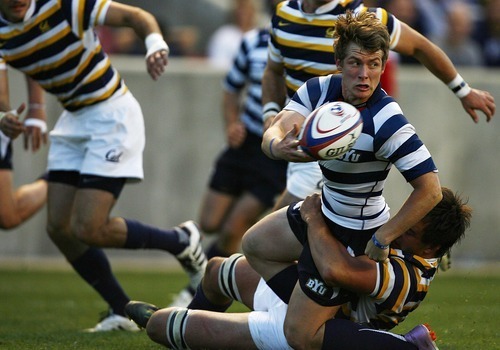 "They played a smart game of rugby," BYU coach David Smyth said. "They came in with a very definite game plan, and that was to starve us of the ball  to keep it with their big fellas and just to keep churning up the field. And they were very good at it, very patient." Patience was key during the first 23 minutes, as the scoreboard remained blank and defense was prized. However, the Golden Bears broke through at the 23:10 mark, when captain Derek Asbun pushed through for a gutsy try near the left side of the goal to give Cal a 5-0 lead. James Bailes then drilled a penalty kick from dead center, extending the Golden Bears' advantage to 10-0 with five minutes remaining in the first half. But BYU showed resolve. Quickly marching down the left sideline, the Cougars mounted an extended power attack that peaked with Apenisa Malani's try. A conversion by Shaun Davies followed, pulling BYU within 10-7. Less than two minutes later, though, Cal struck again. Bailes dropped in another penalty kick, giving the Golden Bears a 13-7 lead just before the half expired. "We couldn't get in there and turn the ball over enough," Smyth said. Penalties plagued the Cougars after the break. Two flags helped Cal maintain pressure, and the Golden Bears jumped ahead 16-7 after a penalty kick 10 minutes into the second half. By the time Cal's Seamus Kelly broke free along the left sideline for an untouched try midway through the final period, it was 21-7 Golden Bears, and Cal's continued dominance over BYU was clear. "I feel like we gave all, and I feel like we played a better team," Malani said. Despite the defeat, finishing one win away from the national championship and pouring out sweat in front of a devoted audience that attempted to carry the Cougars with echoing "BYU" chants left a lasting impression on Malani. "I'm so grateful for the supporters today," he said. R The Golden Bears downed BYU 21-14 to win the College Premier Division rugby national championship for the fifth time in six seasons.